Hadn't been on the bike for around two months. bad back, work, kids Scouts, etc etc, so was looking forward to a decent ride. I was determined to ride the single all the way this time and not do the trailer cop out. I dragged the Big 4 out and as reliable as it's always been, the damn thing wouldn't start. Had those dead as a doornail no spark kicks. Sure enough, pulled the plug and checked the spark and no one home!! Pulled the maggy off and it was full of gunk. Rotor had a bit more end float then it should and the fibre dynamo drive gear was rubbing against the caseing. Cleaned it all up, made a few adjustments and hooked it up to the electric drill for a test and heaps of big fat blue sparks. So, put it all back together, dropped the engine oil and gearbox oil plus a new filter, dipped the chain in the cook up grease tin, lubed the clutch cable, adjusted the tappets & brakes and off for a test run. All good ready for the morning and another Top of the Valley Run. Woke early to a clear chill morning. Already had the bike loaded so a quick start to be out at Maccas Rutherford for 7:00am. It was great to be out on the bike so early, the sun was just comming up, the sky was clear and the air was chill. had the thermal undies under the leathers and with winter gloves on I was off against the elements and loving it. Condensation on the visor from heavy breathing making a kaleidoscope view of the world. Top up the tank at the servo next to Maccas and Thommo is waiting. Not long before Bevan turns up. Geoff calls for advice on setting clutch adjustment. Gary & Red roll in, Lindsay & Jenny, Chris & his mate, then Geoff with his adjusted clutch & his mate. Coffees, hot chocolates & hash browns all downed and time to go. Chris & his mate only went part way, had to turn back for family commitments, good to see them turn up even for part of the run. Kept chugging away, the Big 4 was running like a top. led the pack for a while until the Vincent needed to stretch it's legs and it was away, followed by a pair of Atlii. I tucked in behind Red on the '38 matchless Model X. I didn't know much about this bike, had heard about it, but had never seen it in the flesh. It certainly held a good road speed for a side valve V twin. I could keep with him on the Big 4, for most part, but he'd get away from me on the hills. Looks a very nice bike. Rolled into the car park at the Royal at Denman where Pete on the lightweight Norton Jubilee twin was waiting. Most of us needed to vote, so off down to the polling booth we trundled to do our national duty, back to the car park and Stan had arrived. More chat. As usual, 11:00 o'clock we were off for a 9:00 o'clock start. Out the back road around past the winery and onto the Golden Hwy to Sandy Hollow where we turned of onto the Bylong Way. I'd always regarded this as a great road for the old clunkers. I'd been along here on my girder forked bike and had no worries, the occasional bump, nothing really. The Big 4 was much the same, rigid rear end, but a bit more comfortable with road holder telescopic forks. 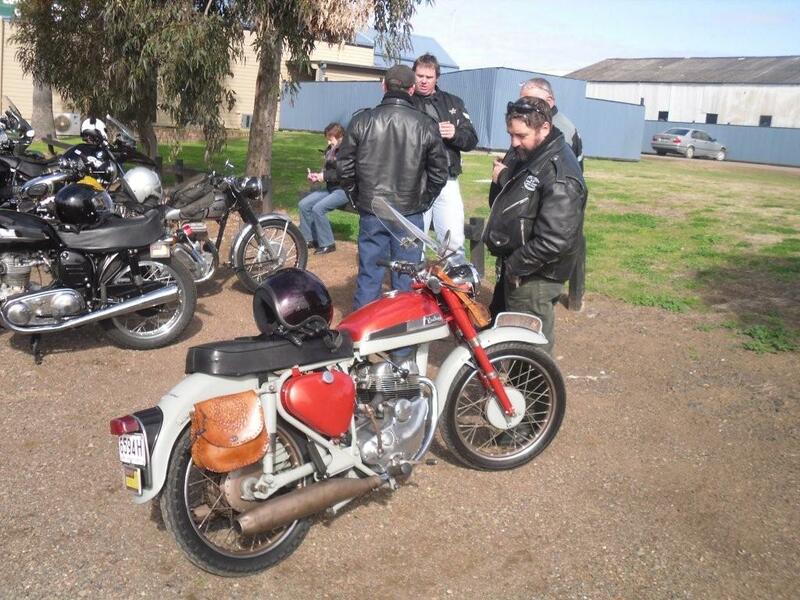 Not far from Bylong Red offered me a ride on the Matchless. I caught up on a few specs of the bike. 990cc side valve V twin. No wonder it did ok on the hills!!. What a smooth motor, pulls away easily, the motor seemed effortless, doing very little work and not needing lots of revs. Unfortunately the seat springs are very stiff. It was like riding with no springs at all. Even the slightest bump went straight up my spine. it exposed the roads for what they really were. There were a few bad patches that would catch you by suprise. As good as the motor was, the seat was bad. Spoilt the ride of the bike. Something Red definately will have to address and after riding the Big 4 which has a similar rigid rear and a much better seat, Red now knows how good his bike can ride. We lunched at Bylong then turned back for Denman. Red offered me the ride on his bike again, I couldn't resist, although I think he was taken with the relative comfort of the Norton. Despite the rough ride, ( I would never have realised that road was so bad!!) I enjoyed the loping power of the Model X and look forward to another ride when Red has improved the seat. All up I did around 80klm on it, so have a bit of a grasp of how a Model X travels. Thanks Red. The others seemed to be enjoying the ride also. Gary was giving the Vincent it's head, while Geoff & Bevan were working their respective 'Atlii' Pete was bringing up the rear on the lightweight 250 Jubilee twin. While lacking in power Pete says it is loaded with fun and a joy to scoot around the twisties. It certainly sounded the part as he wicked it on as he flew past us at the catch up point and got the drop on everyone as he kept going, turning the tables so it was now we that would have to catch up to him before Denman. Back at the Royal and a few refreshments and tales of the road to Bylong & back before we headed for home. We decided to stop at the Tavern at Jerries Plains for no particular reason. Lucky we did because we were served a treat by a nice couple of pair selling raffle tickets and wandering about with free nibblies. Yum Yum. Off again and we started to go our respective ways. Thommo, Stan & I turned off at Warkworth for Broke. Wallaby Scrub Road is named for a good reason, not only were there wallabies along the road but a couple of good sized kangaroos as well, not to mention a couple of wombats. Looked like mother & child waddling along the side of the road. Watch out blokes!! Across through Broke and heading for Wollombi, all was going well. The Big 4 was roaring and going great till suddenly that dull throaty sound that comes from the carb when there is no sound comming from the exhaust and the bike rolled to a stop. Look in the tank and she's bone dry. What the....!!! Thommo & Stan pull up behind with cries of 'Whats up?' 'I'm out of juice' says I.. In chorus with jaws agape the both blurt...."Ya gotta be Joking....!!!" Out with the drink bottle & drain 750ml from Stans tank. Off we go again. Through Wollombi and trying to make Millfield before the servo shuts supposedly at 6:00. Half way to Millfield she dies again. Thommo says we've done 18klm. I didn't fill the bottle this time as Stans tank is also getting low. 700mls and we're off again. It's getting dark. Into Millfield and the servo is already shut. Head on to Cessnock. Under the railway bridge and she dies again. Thommo says only 12 klm that time. We're a stones throw from Cessnock, so I squeeze another 250mls from Stan's tank and we're off again. First servo we come to is a Metro. Dunno about that stuff, do they put paint thinners in their petrol or what, I go straight past. Running on vapours theres another Metro, do I pull in or what. I stop & confer with Stan & Thommo, both have their doubts, but I'm out of petrol and am driving past servo's. Thommo says the Caltex is only a klm down the road, we're off and glide into the servo and give two very thirsty bikes a big drink. I'm all but out of fuel and my tank takes 11.91 litres to fill it. Thommo lives around the corner and invites us around for a coffee, which we take him up on. After the obligatory check out the shed we drink our coffee and go over the day. All agree it's been tops and now we've done a run out that way, we should organise it better next year, leave Denman earlier (hopefully no voting next year), get to Rylestone for lunch and have time enough to get back in the arvo. Stay overnight and have a ride on Sunday. It was well and truly dark when I left Cessnock. A clear moonlit sky with a chill in the air. I went back across to Ellalong and across Sandy creek Road, up over the gap to Freemans Water hole then across the back road through Teralba and home. It was a good run for the 6 volt headlights. Away from the streetlights and oncomming traffic, the lights were fine. it's good to have everything working on the old clunker.